WASHINGTON — As Islamist insurgencies spring up across the globe, one of the most vicious insurgencies in recent memory is taking place in Nigeria. Reuters reports that Boko Haram’s resistence to the Nigerian military has forced Nigeria to ask for help. 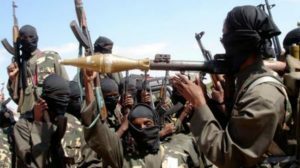 Boko Haram, which has links to the international terrorist network al-Qaeda, is causing the Nigerian government so many problems that the beleaguered government has asked neighboring Niger to intervene and help. This shows how dangerous Islamist militants are for the African nations, as seen in the civil war in Mali. Nigeria is now embroiled in a week-long offensive against entrenched Islamist militants, who are imposing sharia law in their areas of control. Niger and Nigeria signed a bilateral defense treaty in October 2012 that included the sharing of intelligence on Islamist groups and joint military exercises. The deal says that if one of the partners ask for military aid, it cannot be refused. Will Niger live up to its side of the deal? Nigeria has 1,200 troops stationed in Mali, where France demolished Islamist forces linked to al-Qaeda late last year. Nigeria has said it will not withdraw these troops in Mali, which are to provide stability in that country, to fight their offensive against Boko Haram.